Russia’s competition watchdog believes that a merger between two of the country’s top steelmakers, Evraz and Severstal, is a “pipe dream”, and will veto it if it is attempted. The swift, explicit reaction from one of the Russian government’s top market regulators indicates there has been no preliminary signal from the Kremlin of backing for the merger, announced in a carefully contrived placement in the Financial Times of London yesterday. 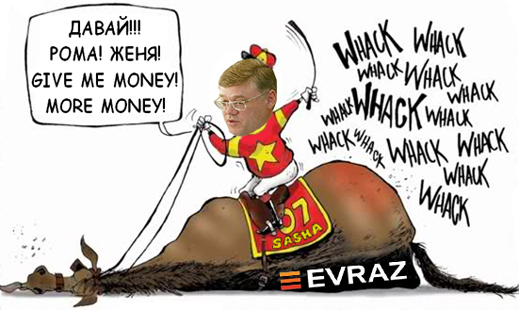 Ovchinnikov was responding to a claim published by Alexander Abramov, one of the control shareholders of Evraz and chairman of the company board. According to Abramov, the merger with Severstal would be “a good idea”. The attempted merger between Severstal and Arcelor in 2006 — rejected by Arcelor in favour of Mittal Steel — was taken by Severstal owner, Alexei Mordashov, to then President Vladimir Putin for approval, which he gave. There has been no sign of a comparable action, or approval, in this case. Severstal spokesman Natalia Ivanova declined to respond with her company’s comment. However, in first-reaction trading on the London stock market on Tuesday, Evraz dropped 3%, while Severstal rose 6%. By the day’s close, Evraz stood at 362.5 pence, up 2% on the day. A day later, at the start of London trading, Evraz was 360p, down 1%. Severstal rose 4% on December 13 to $11.69 per share, but it too is falling today. Moscow industry sources believe Abramov’s motive for planting his merger idea in public was to lift the share price and challenge his fellow shareholders in Evraz to buy him out. Abramov holds a 24% stake in the company, while the Millhouse holding of Roman Abramovich and Eugene Shvidler has 35%. Chief executive Alexander Frolov holds another 12%, while the free float is at 24.8%, below the threshold required for Evraz’s listing on the main board of the London Stock Exchange (LSE). Abramov, Abramovich and Frolov are bound together in a longstanding agreement not to make significant share sales affecting control of the company without securing consensus. Earlier this year, they attempted to sell their stake in the coking coalminer Raspadskaya, only to be outwitted by their co-shareholders in the mine company, Gennady Kosovoy and Alexander Vagin, who announced that they too were selling out. Noone wanted to buy both groups of shareholders out at the demand price, and the proposed transaction failed. This time Abramov may be taking a leaf out of Kosovoy’s playbook. He is quoted by the Financial Times as saying he is ready to sell his Evraz shares to lift the free float above the threshold, but not at the current share price which, according to Abramov, “is far too low.” As a control shareholder Abramov is not an independent board chairman according to the LSE rules, and must step down. He told the newspaper he will. Abramov’s undertaking on this point may have been ordered by the UK regulator, the Financial Services Authority (FSA), as a condition of the latter’s approval of Evraz’s change of domicile from Luxemourg to the UK, and its application to be listed on the LSE main board. That occurred on November 7. This week Evraz has been admitted to the FTSE-100 index, and will be the only steelmaker included in the index for the time being. An Evraz statement has noted that Evraz has traded internationally through General Depositary Receipts since 2006 and since its admission to the LSE last month, is subject to a waiver issued by the UK Listing Authority of its 50% free floating share requirement to permit the move. According to Evraz management estimates, inclusion in the FTSE-100 index will result in additional inflows of around $200 million to $600 million from investment funds which track the FTSE-100 index. Abramov told the Financial Times he has scant regard for the UK listing rules. “We [the company] could have found a nicely dressed person from the City who could do this job but I was informed this would not be a good idea from the perspective of our shareholders,” Abramov is quoted as saying. By shareholders Abramov meant himself. Moscow industry sources are skeptical that this can be demonstrated. They are confident there has been no Kremlin decision that it should.